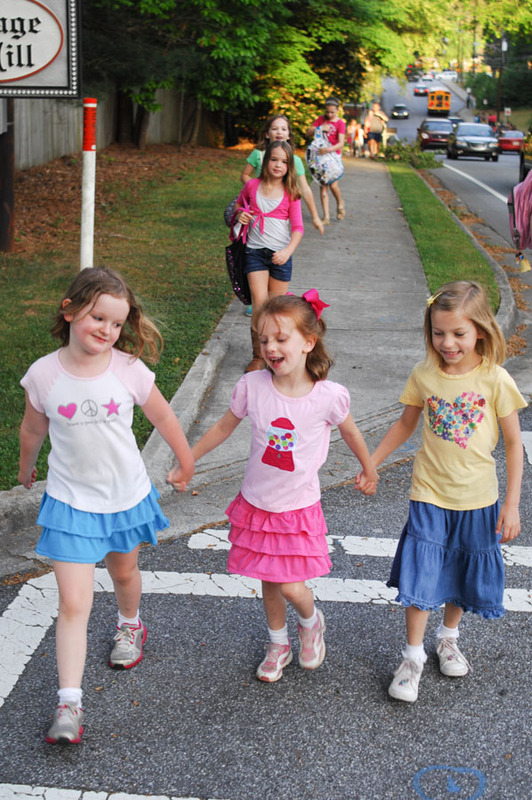 Dunwoody Walk to School Day wednesday May 2, 2012 7:45am from the Vermack Swim and Tennis Center on Vermack Road to Dunwoody Elementary School on Womack Road. Students and parents walked one mile total on Vermack, and then a right turn on Womack, and then a right turn into the elementary school grounds. Front row (ltor) Elle McNeese, first grade [blue white], Ella Odom, kindergarten [pink red], and Molly Paris, first grade [yellow blue]. And behind (front to back) Meg O’Keefe, third grade [pink white], and Amelia Blake, second grade [green].